The purchase cycle for a first time business purchase of some significance is not a singular event nor is it just a few singular events. Rather, we have found it to be a process of interwoven and complicated activities that normally stretches over a period of a year! This idea of using a "double-reverse close" or an "assumptive close" simply does not fit for most "Relationship Selling" situations. When our students say they want us to teach them how to close we know they want some magical method for getting orders without the necessary long term effort that is crucial to success. We have found the purchase cycle to look something like the following schematic. Target clients need to get continuous contacts and an information stream that includes: phone calls, faxes, post cards, personal visits, joint visits, news-letters, PR articles, etc. This kind of activity is what relationships are all about. Everyone wants an order without any effort. This however, is not realistic. We must select a relatively small number of accounts and really work on them. We must select a relatively small number of target accounts and get them into the purchase cycle. Even with this tremendous contact and information stream some potential clients will go to competitors but without it, most will go to competitors. This is why it is so important to focus on a relatively few number of customers. It is easier for sales people to go after hundreds of customers instead of focusing on 20 to 30 accounts. The new sales person will tell his boss he made contact with many customers but he will never sell them. Selling involves helping customers and getting to know their needs. This can only be achieved with many repeat contacts. We must maintain a global universe of customers and prospects and tele-prospect them to determine the ones that can buy from us and the ones that have an interest. Once we have determined that a prospect has an interest we can move the prospect into the purchase cycle. Microsoft Access databases can help enormously in keeping track of all the contacts that have taken place over time. We must have a comprehensive system to find clients, qualify them and move them out or into the purchase cycle. 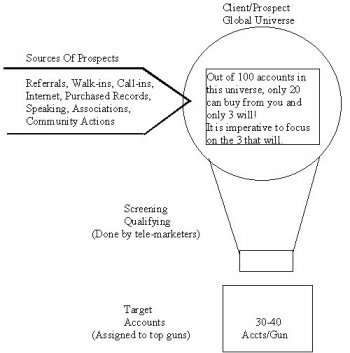 A small company can have only a couple of hundred accounts in the target account box. Lower cost "tele-prospecters" can do a good deal of the screening and qualifying and then the accounts can be assigned to "top-guns" to follow up. There are some things we can do to reduce the purchase cycle, but we should not plan on making purchase cycle reductions a required activity, since more will go the full cycle than will not. � Establish a sense of urgency - this is the key. � Promotions that are time limited - offer expires in 30 days. � Limited availability - only ten left. � Delivery ease - here it is right here and I will bill you later. � Opportunity loss avoidance - if you do this now you can take advantage of an opportunity and will not lose out. � Cost continuation reduction - if you do this now your costs will be reduced immediately. � Investment avoidance - If you do this you will not have to buy that. � Immediate sales increase - Doing this now will generate significant sales increases. � Problem avoidance - If you buy this now the roof will not cave in. � Comfort level exists and trust of your word is enough. I just trust this guy. � Impulsive purchase - Just bought it because it looked right. � Greed - appeal to a customer�s greed. Getting something for nothing. � Ego - appeal to a customer�s ego. It�s cool to do this.